Retinol is a proven ingredient to reverse sun damage and improve the appearance of fine lines.Try to buy one that comes in tubes or pumps, because retinol products degrade quickly when exposed to light and air. It is very important to use retinol only at night, because it increases sun sensitivity, and you should never apply a retinol to damp skin, because it will cause irritation. 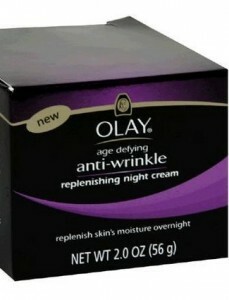 Olay Age Defying Anti-Wrinkle Night Cream ($14.99, Walgreens.com) and RoC Retinol Correxion ($19.99, Target.com) are two great options available.